2. Defendant James Avery, individually and in any official capacity. Avery is mandated by law to publish the “qualifications and manner” of making claims for citizen’s Article 7, Section 10 rights. Avery violates his obligations mandated by law, there is no legal “manner nor legal qualifications” that Avery disseminates – it is all a fraud to cheat citizens. Avery is a RICO defendant in an association-in-fact with all defendants. 3. Defendant Alan Miles, WSBA #26961, individually and in any official capacity. 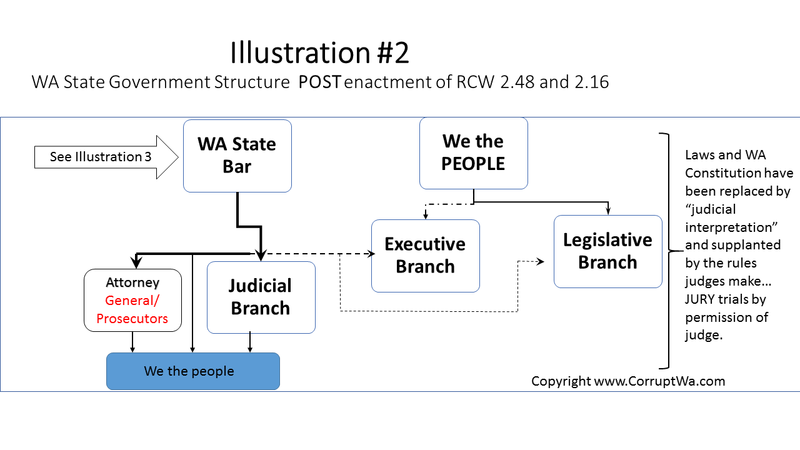 Miles serves three masters – the US and WA constitutions by his oath; the WA State Bar as a condition of his license to practice law; and the county assessor by virtue of his salary and job description, deputy prosecutor, governed by Kitsap County. Miles aids and abets Avery’s fraud. Miles is a RICO defendant through association with the Bar and in an association-in-fact with Avery. 4. Defendant M. Karlynn Haberly, WSBA #8674, is Kitsap Superior court judge. She is being sued for acts in a non-judicial capacity and in abuse of color of law for which she has no immunity. Haberly serves three masters – the US and WA constitutions by her oath; the WA State Bar as a condition of her license to practice law; and Kitsap county and WA State by virtue of her salary and job as judge for Kitsap County. Defendant Haberly’s conflict renders her ‘disqualified to sit as judge” under RCW 2.28.030, CJC 2.11 and her violation of this law is official misconduct. Haberly is a RICO defendant by her association with the Bar and in an association-in-fact with Avery in the crimes they commit. 5. Defendant Kay S. Slonim, WSBA #12414, individually and in any official capacity. Slonim serves three masters – the US and WA constitutions by her oath; the WA State Bar by her obligations to the Bar; and the State by virtue of her salary and job description chair of the Board of Tax Appeals, governed by the State. Slonim aids and abets Avery’s fraud. Slonim is a RICO defendant in an association-in-fact with the Bar defendants and Avery. 7. Adding, Defendant Washington State Bar Association (“WSBA, Bar, Association”) is a private organization existing under the laws of the State of Washington, having its principal office and place of business in King County, Washington, within the territorial jurisdiction of this court. For purposes of this action the WSBA is a “person” The WSBA is a fiduciary tasked with maintaining the “integrity” of WA State’s judicial system and to insure lawyers ‘protect and maintain’ Scheidler’s individual rights. 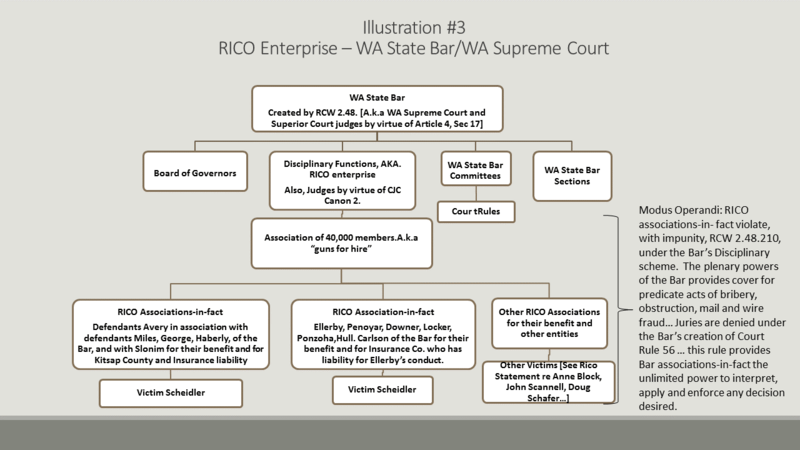 The WSBA betrays the trust and is a RICO enterprise. 8. Adding, Defendant Jane and John Does, 1-100, who have not yet been identified. 11. WA State Bar Associates: David Jurca WSBA #2015, Jeffrey Stier WSBA #6911, Scott Ellerby WSBA #16277, Cassandra Noble WSBA #12390, Zachary Mosner WSBA #9566, Felice Congalton, WSBA #6412, J. Reiko Callner, WSBA #16546, Bruce Lemon, WSBA #9326, Ronald Schaps, WSBA#2203, Elizebeth Turner, WSBA#24165, Cathrine Clark, WSBA# 21231, Melody Retallak, WSBA # 40871, Jeffrey Downer, WSBA#12625, Joel Penoyar, WSBA #6407, Jill Johanson, WSBA #15649, Adel Ferguson, WSBA #31246, Gauri Locker, WSBA#39022, Russell Hartman, WSBA #7104, Kevin Hull, WSBA #23994, Clerk of the Supreme, Susan Carlson, WSBA #12165, Keith Harper, WSBA #10742, Jennifer Forbes, WSBA #26043, Frank Cuthbertson, WSBA #23418, Ernetta Skerlak WSBA #14128, Eric Miller, WSBA#41040, Cam Comfort, WSBA# 15188, Dionne Maren Padilla-Huddleston WSBA # 38356, Sally Briggs Leighton, WSBA#12156, Alexis Foster, WSBA#37032, Mary M. Tennyson WSBA #11197, who may be named defendants at a future time. 12. Clerk of the Court of Appeals, David Ponzoha, who may be named defendant at a future time. 28. 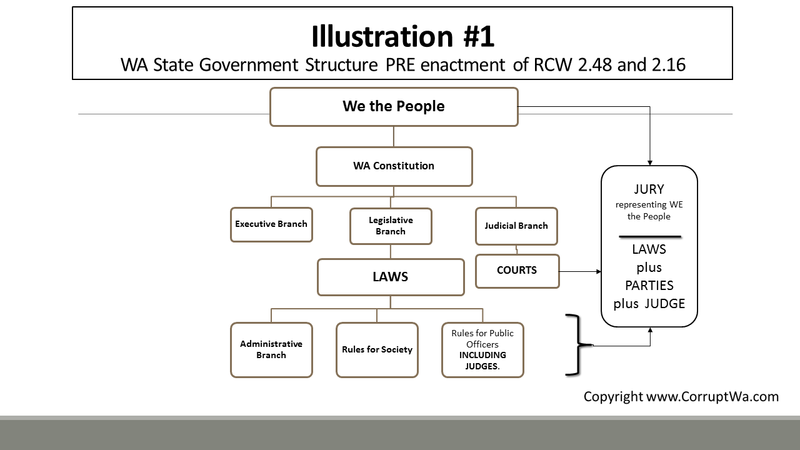 Defendants, who are all government officials, have as their preeminent duty, established by Article 1, Section 1 of WA Constitution, to “protect and maintain” Scheidler’s individual rights. 29. If these defendants abided by their “preeminent duty” and abided by the laws that govern their conduct, and would tell the truth rather than lie upon lie, the cascading and interrelated set of unfortunate events – criminal events — would never have occurred. 30. For argument… Circa 1998, if Carol Belas, as then Kitsap County Assessor, simply did her job as her oath demands, and “corrected” Kitsap County’s misrepresentation of a controlling law occurring within a document that must be signed by Scheidler as “true” under penalty of perjury, which is a black and white issue, the cascading unfortunate events that spanned 17 years would never have occurred. … Scott Ellerby, a Bar associate, would not have been retained by Scheidler to sue Belas for the misrepresentation and due process violations she caused by not doing her job… Cassandra Noble, Kitsap county prosecutor, would not need to extort Ellerby’s withdrawal from Scheidler’s case in order to save the Assessor, … Scheidler would not be forced to sign the assessors fraudulent document under duress, … The bogus APA hearings conducted by Slonim would never have taken place, … The lawsuits filed by Scheidler against government officials for the lies they tell would not have been filed, … the grievances resulting from lawyers lying would not have been filed … the Bar would not need to cover-up the crimes their associates commit in dismissing grievances … the grievances against judges for lying would never need to be filed; and those grievances dismissed by the CJC to cover-up the crimes of judges… the $248,000 in SANCTIONS imposed upon Scheidler as retaliation for seeking due process and in trying to hold lawyers and judges to the “law” wouldn’t occur… the RECALL petition to remove a corrupt Bar official who lied to cover up crimes of his colleagues involved in the cover-up of Ellerby’s role in the assessors fraud would not have been filed … the legal appeals to correct the lies and deceit would never needed to be filed … the appellate judges wouldn’t need to fabricate facts to cover the crimes of defendants, … the Clerks of the Appeal Courts wouldn’t needed to violated their duties by not filing pleadings in order to hide the lies being told by judges and lawyers, … Judge Leighton would never see this case and be told by defendants to deny Scheidler’s due process … . the 9th Circuit would not be involved to “reverse and remand” this case back to Leighton because Leighton denied Scheidler’s due process … It is 17 years that document “one corrupt act upon another to hide corruption, incompetence, negligence… And at the center is the WA State bar in betraying its fiduciary duty to insure the “integrity” of our judicial system through its “regulatory” powers. It is so complicated and there are so many roads. It is a twisted mess and who knows if someone will be able to get out of this spider web. It might take hundereds of people to work and find an end to this. Just like it took hundreds of people to create this corruption and mess. Lord be with us. One thing is clear to me, they are friends of friends and belong to a selected group of people. This and only this way are they able to continue what they are doing. To me they are bunch of heartless bastards that need to exposed. I hope they go to prison. “Jail” is where they all belong. I won’t give up until that day comes…. So long as judges judge judges, nothing can or will be done to eliminate court crime. I would add… so long as ‘the people’ allow judges to judge judges nothing will eliminate court crime. It is our problem to fix … but how? Although many government fixes are possible, court crime is impossible to fix. The legal triumvirate (lawyer, judge, State Bar Association) would never allow it. Public corruption is the biggest single threat to America and makes any foreign terrorist organization look like Cinderella. Legalized court theft is the biggest business in America, with the State probate courts and the Federal bankruptcy courts being the cash cows relied upon to make jurists’ dreams come true. The collateral damage is far reaching and harms many innocent women and children. Exactly, that is why we need to add “one” to the triumvirate — a mandatory “jury” with the “power of the court”. In other words the “jury” finds for the plaintiff or defendant — just as always, but also can punish judge and lawyers too. Judges determine what is “mandatory” and the type cases you cite will never see a jury. They never have and never will. A Writ of Mandamus is supposed to satisfy what you say. Dead on arrival. 18 USC 4 is also a lawful remedy. Dead on arrival.